Lateral forces between solids play an essential role in everyday life. Examples are frictional forces that allow tires to grip on the road, doors to creak and chalk to grate on the blackboard. Lateral forces between interfaces allow one to assess interatomic bond strengths and the integrity of crystal lattices. In particular, by shaking atoms in a periodic fashion with lateral forces one can create shear acoustic waves. The displacement of shear waves is perpendicular to the direction of propagation. Detecting shear acoustic waves means seeing with acoustic 'eyes', and allows the elastic response of solids to shear forces down to length scales of the order of the acoustic wavelength to be probed. To visualize the mechanical properties of solids on ever smaller length scales in line with the present trend to miniaturization, there is therefore a strong motivation to decrease the acoustic wavelength, and hence increase the acoustic frequency. High frequency shear acoustic measurements on solids have up till now been conducted using pure tones of sound. We now report on an optical method to generate and detect picosecond (10-12 s) acoustic shear waves in pulsed form, opening up the possibility of the real time probing of lateral forces with acoustic wavelengths down to the nanometer range ('Coherent shear phonon generation and detection with ultrashort optical pulses,'O. Matsuda, O. B. Wright, D. H. Hurley, V. E. Gusev, and K. Shimizu, Phys. Rev. Lett. 93, 095501, 2004, and Phys. Rev. B 78, 024303, 2008). We adapt a technique known as picosecond ultrasonics, in which ultrashort optical pulses generate and detect the acoustic pulses at the surface of a solid, essentially a sonar technique relying on echo detection on picosecond time scales. A sticking point in this field has arisen because of a problem of symmetry: with isotropic materials or symmetrically cut crystals, it is only possible to generate picosecond acoustic pulses polarized in the direction of propagation, or longitudinal acoustic waves. However, by using asymmetrically cut single crystals we show how picosecond shear acoustic pulses can now be generated and detected. The principle is illustrated by the example in the figure below. The blue region is an opaque metal crystal and the yellow region a transparent glass film. By stressing the sample by pulsed light absorption in the red region, the slanting atomic bonds —the springs in the figure— generate a shear acoustic displacement parallel to the boundary. 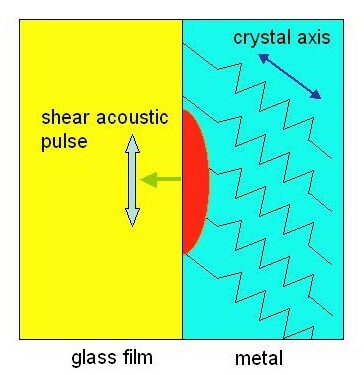 Shear acoustic strain generation in a glass film by light absorption in a metal. Longitudinal acoustic strain pulses also generated are not shown. The red region corresponds to the volume heated by an ultrashort light pulse. In our study the commonly available metal zinc and the semiconductor gallium arsenide are shown to be efficient picosecond shear acoustic transducers at room temperature. Having both shear and longitudinal acoustic pulses to work with allows one to probe both the lateral and longitudinal response of solids at high frequencies up to 1 THz (1012 cycles/second) and above and down to nanometer wavelengths, giving a much finer-scaled picture of their elastic properties. This new-found ability to probe with picosecond shear acoustic pulses should allow the investigation of the role of tiny nanoscale features of a material on the transmission of lateral forces, and enable the study of picosecond frictional forces. This work should also help accelerate the development of nanoscale engineering, contribute to the evaluation of nanocrystalline materials, and open the way to the totally unexplored field of ultrashort time-scale tribology. The impressive feat of picosecond shearing of solids, albeit not of sheep, has now become a reality. Baaaaaa!